Extremely sharp and light weight. Designed for surgical grossing and autopsy procedures. Extremely sharp edge allows a wide variety of sectioning and trimming tissue samples. Disposable blades can be easily inserted into handle. 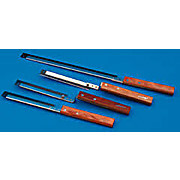 These reusable handles and disposable blades are ideal for surgical specimens and dissecting work. 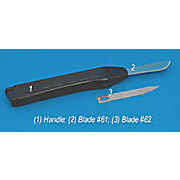 These sterile stainless steel blades are available in size #61 and #62 and are approximately 2 inches long. The durable plastic handles are autoclavable.